After years of renting, maybe you dream of owning your home. Perhaps you’ve been looking through online real estate listings, checking out open houses, or even watching HGTV all day long. Owning your own home is radically different from renting so its important to figure out if you’re ready to buy. Here are five signs that you’re ready to make the leap to homeownership. Ready to say farewell to your semi-nomadic life and put down roots in a specific neighborhood? Then buying a home is a good investment. Since buying a house is a huge investment, financial experts typically advise that you should prepared to stay in your home for at least 5 years before moving on. Banks and lenders use your credit score to determine whether you’re likely to pay them back. You don’t need a perfect credit score to buy a house but your credit score should be at least 640 (if you have a credit score of at least 580, you may qualify for an FHA loan). The higher your credit score, the more likely you’ll be approved for a mortgage with a favorable interest rate (which will save you money over the length of your mortgage). There’s more to being ready to buy a house than just having a down payment and being able to make the monthly payments (though that’s still definitely good to do!). You also need to be able to afford insurance, property taxes, utilities, and maintenance costs. It can add up fast so be sure to do the math. Just like in life, it’s important to expect the unexpected when it comes to homeownership. Whether it’s unexpected repairs (you can reduce this occurrence with a new construction home thanks to warranties) or replacements, you don’t want to be caught unaware. It makes sense to have a healthy savings and emergency fund in place. This will allow you to cover surprise costs without needing to rely on your monthly income. It goes without saying, but it’s useful to know what you’re looking for. You don’t need to know what you want down to the very last detail (actually, it’s better to keep some level of flexibility) but at least have a basic idea of what you want, like the neighborhood you want to live in, the ideal number of bedrooms and baths, and any special must-have features. If you can answer ‘yes’ to these factors, then its probably time to start considering buying a new home! We have plenty of resources to help you along your homebuying journey. If you’re trying to decide between a new home or a resale home, learn about the value of buying a new construction home and some critical questions to ask when buying new construction to help you make the decision that’s right for you. And here are some tips to successfully navigate an open house when you start touring homes! 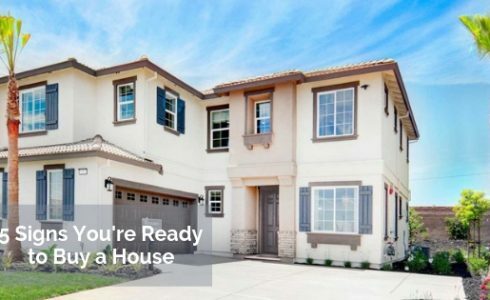 When you’re ready to make the leap to homeownership, visit DiscoveryHomes.com to learn more about our communities throughout Northern California and Nevada.